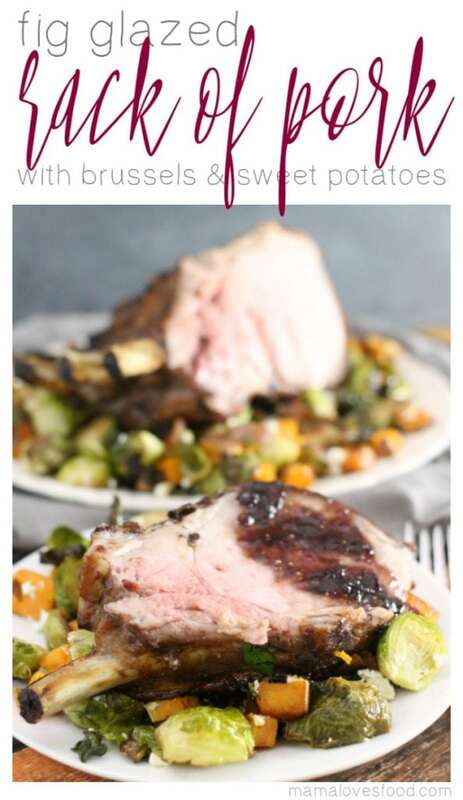 Our easy Rack of Pork with Roasted Brussels Sprouts and Sweet Potatoes is the perfect dish for your holiday dinner menu! 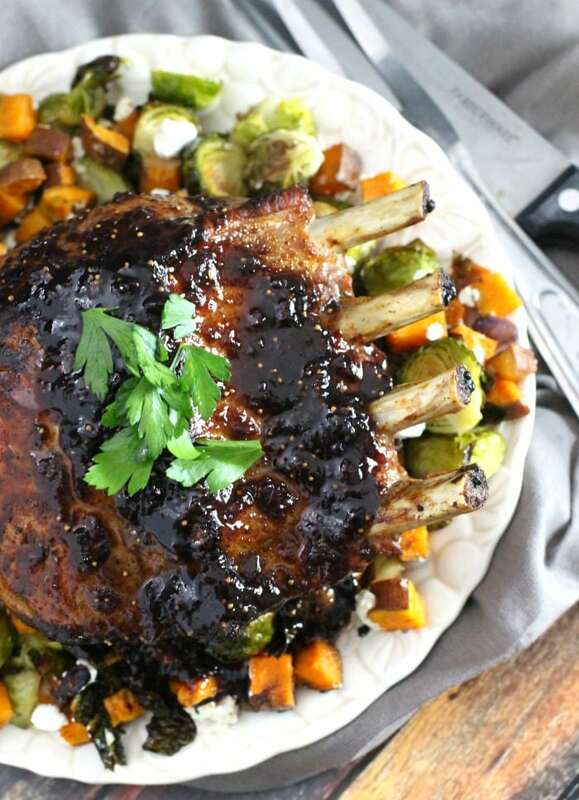 Rack of pork is easy, delicious and a beautiful dish. If ever you’ve needed to have a deliciously fancy looking meal but don’t know what to make – this – THIS – is the one! 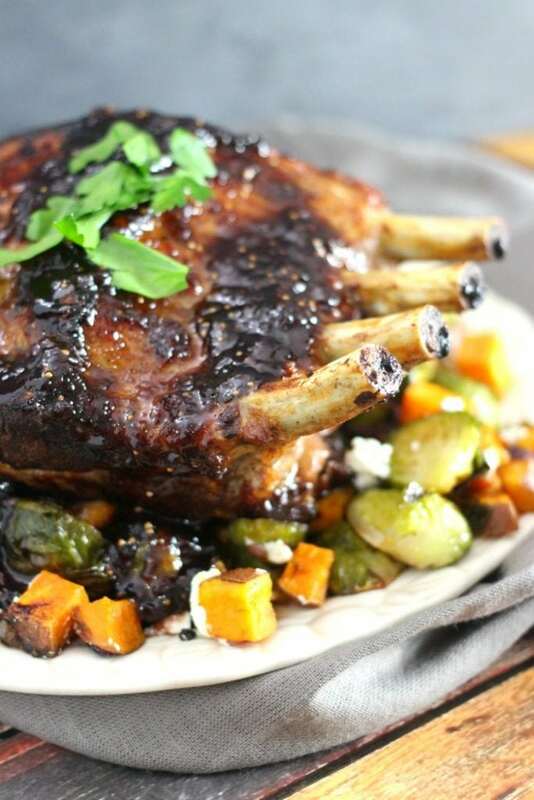 A frenched rack of pork recipe is a great show stopper for you to impress your friends and family. Presentation is absolutely gorgeous – perfect for a big holiday dinner, but the preparation couldn’t be easier. 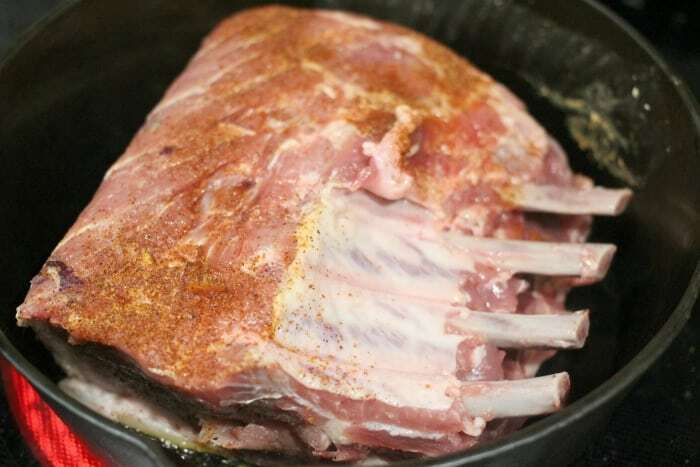 A lot of folks balk at the idea of cooking rack of pork, but I will show you how to cook a rack of pork easily and successfully. And flavor – oh. my. word. I cannot express enthusiastically enough how good this tastes. And make sure to finish the meal with something delicious like pumpkin ice cream or carrot cake! 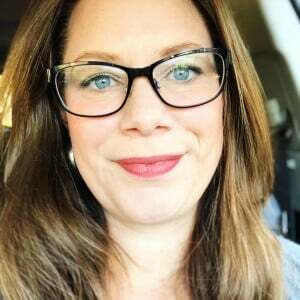 This article is a partnered effort with the National Pork Board. Rack of Pork – 4 to 5 pounds, or about 8 ribs. Brussels Sprouts – Sprouts vary in size, but aim for approximately 20 sprouts. If very large, you can cut in quarters. 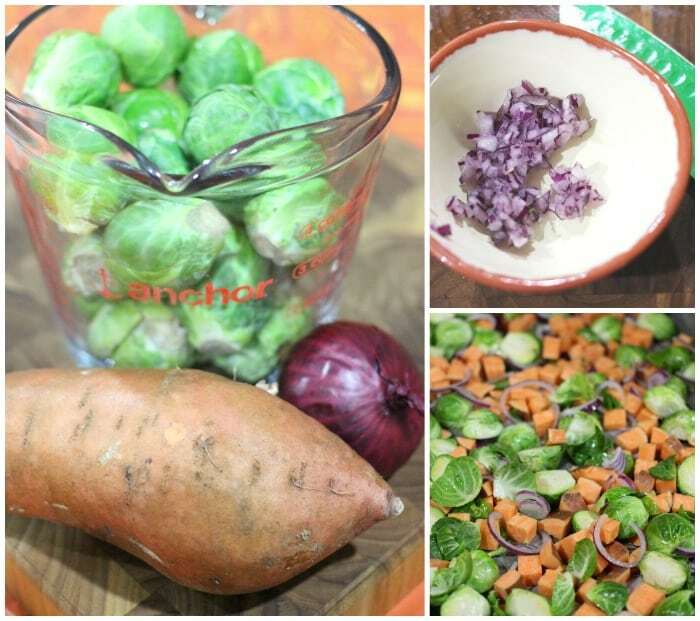 Sweet Potato – One large sweet potato is enough, or you can use 2 medium sized taters. Red Onion – You will be slicing about 1/3 into rings, so get a medium to large onion. Garlic Salt – This staple should be in everyone’s kitchen! Salt & Pepper – Use kosher salt and freshly ground pepper both for taste and presentation. Fat or Oil – The fat is for searing, so use an oil that has a high smoke point (not olive oil, which is not for high heat cooking). I recommend avocado oil as it has a neutral flavor, a high smoke point, and is a good source of healthy fat. Fig Preserves – The combination of fig and pork is unbelievable, and the presentation of the fig sauce is so pretty. 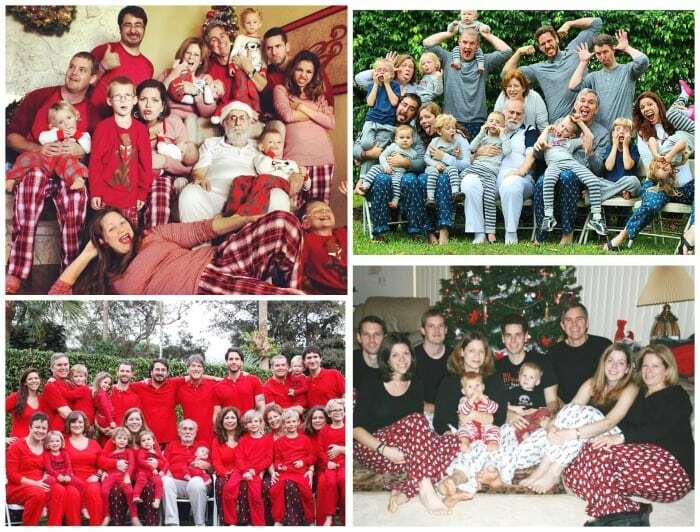 Red Wine – You will be reducing this, so choose a wine you would drink, as the flavor will come through!! Soy Sauce – A little umami and saltiness comes from just a small amount. Crumbled Feta or Goat Cheese – This is an optional ingredient, but the saltiness of the cheese with the sweetness of the fig preserves is heavenly. First, pat dry and season your roast. Next, sear the meat and then place in oven on baking sheet. Then, cut up, prepare, and season vegetables. Next, add vegetables to baking sheet with pork and return to the oven. Then, while pork and vegetables are roasting, prepare fig sauce in pan used to sear pork. Finally, plate vegetables and place pork on top. Drizzle with fig sauce and serve. 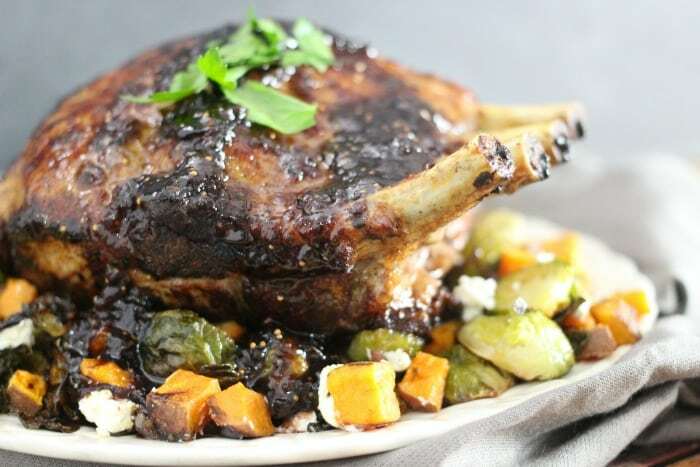 “Pork rib roast is also referred to as rack of pork (it also may be labeled center-cut pork loin). The cut originates in the rib area of the loin, so it contains a bit more fat which makes it flavorful. 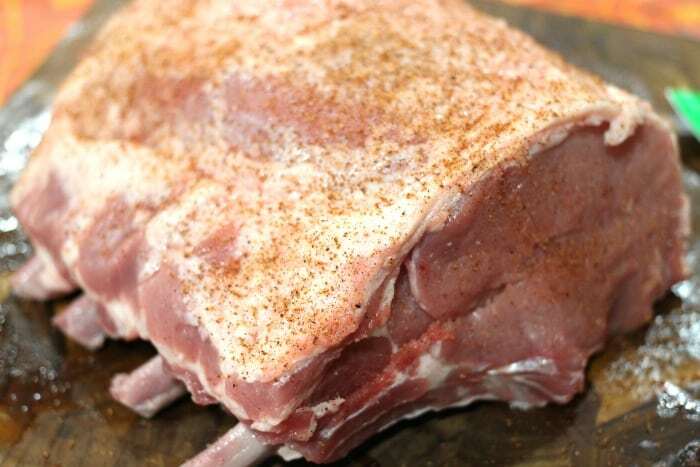 The pork rib roast/rack of pork is the pork equivalent of a standing beef rib roast or a rack of lamb. 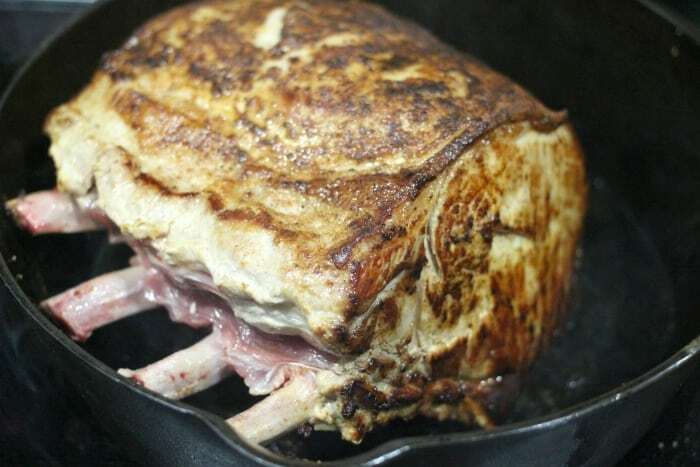 For reference, a pork rib roast/rack of pork is a simpler version of a pork crown roast, which is a pork rib roast/rack of pork turned into a circle and tied. This cut makes a show-stopping centerpiece for an elegant dinner. Your rack of pork should serve about 1 rib per person. An 8 rib roast should be about 4 to 5 pounds and serve 6 to 8 people. Frenched is the culinary term for cutting away fat and meat from the bone for presentation. It adds a touch of elegance to the meal. You can do this yourself or ask your butcher to do it for you when you order the roast. 15″ Cast iron pan – This. Pan. Is. Huge. Literally massive. I have two and they’re sooooooo amazing. I love using these on my grill to make a beautifully seared steak or some yummy Old Bay shrimp. And in my oven or on the stovetop when the weather’s no good for grilling! 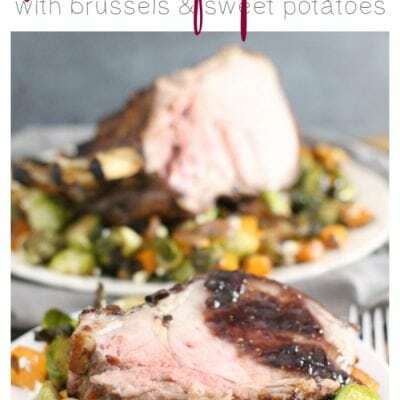 Rack of Pork with Roasted Brussels Sprouts and Sweet Potatoes recipe is the perfect holiday dish. Pat the pork dry and season it lightly with salt and pepper. Heat a skillet (I used a cast iron) with a small amount of fat or oil until very (very) hot and sear the pork on each side for 2 - 3 minutes, until browned. Place pork on a baking sheet into a 450 degree oven, middle rack. Set timer for 20 minutes. 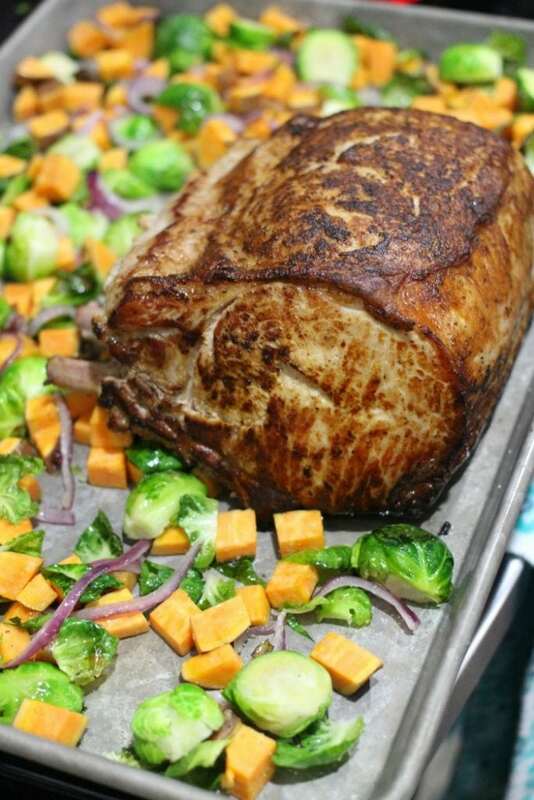 While pork is roasting, cut sweet potato into half/quarter inch cubes, and stem/halve the brussels sprouts. Slice 2/3 of the onion into thin rings, and mince the remaining third. 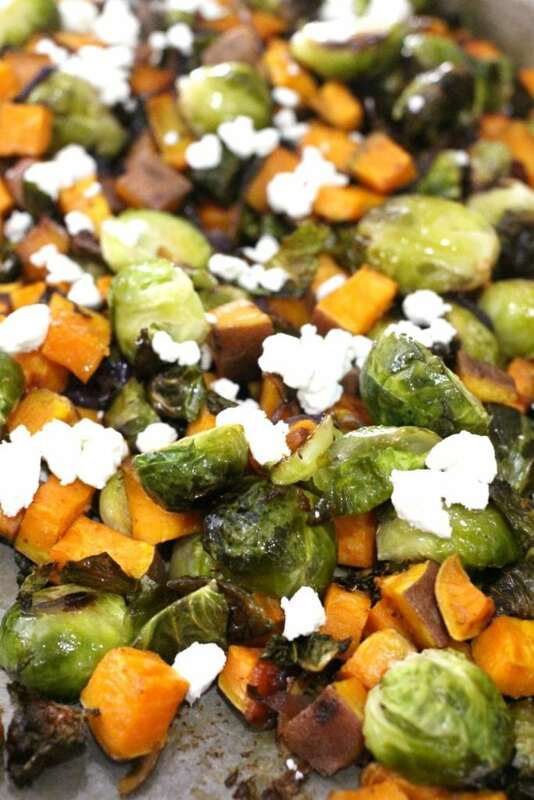 Toss brussels sprouts, sweet potato, and onion with a little bit of oil, and sprinkle generously with garlic salt. When 20 minute timer ends, add the vegetables and ringed onions to your baking sheet with the pork in a single layer. If the pork looks like it's browning too quickly, turn it over. Set an additional 20 minutes on the timer. 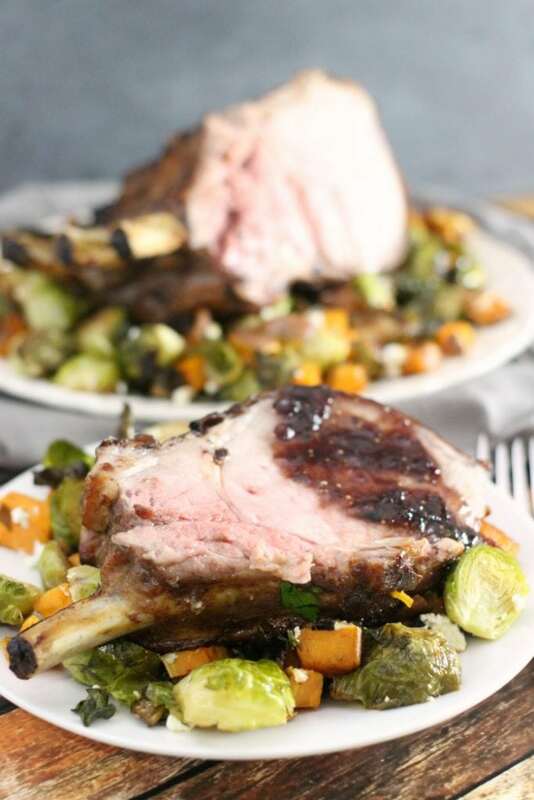 While the pork and vegetables are roasting, bring your skillet that you used for searing back up to medium/high. Deglaze the pan by adding red wine and stirring for a few minutes (to release everything from the bottom of the pan into your sauce. Add fig preserves, minced onion, and soy sauce, then simmer until reduced to about half, or less (depending on your preferred consistency). When timer ends, check vegetables and pork for doneness (using a fork on the veggies and meat thermometer on the pork). Remove each as finished (they might not finish at exactly the same time). The National Pork Board recommends that for tender, juicy and delicious pork loins, roasts, chops and tenderloins to cook them like you would a steak – until a digital thermometer reads an internal temperature between 145°F (medium rare) and 160°F (medium), followed by a three-minute rest. For easier slicing and to let the pork juices redistribute throughout the meat, remove larger cuts, such as roasts, from the oven and let them stand and rest for a total of 10 minutes before serving. Place vegetables on serving tray (and optionally sprinkle with cheese), then place pork over top. Drizzle generously with fig glaze. I am currently making the Fig Glazed Rack of Pork recipe. What do I do with the 1/3 onion that I set aside in step 4? Thank you for your quick response! This recipe was absolutely delicious. The roast came out perfect and so tender. I love the addition of fig preserves, it adds so much flavor! This is such an elegant meal!